Disfunctional family the Harvers, go on a camping trip in the English countryside to reconnect and get away from technology. They arrive at Hansen's Farm and set up camp. Years earlier the Hansen family had been struck by tragedy and their home now seems abandoned, but is it? 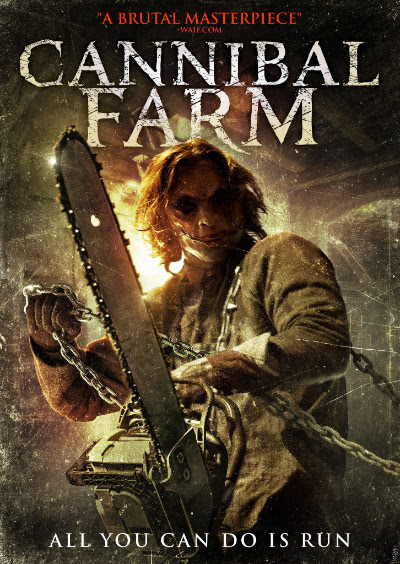 The Harvers have their camp sabotaged and when they seek help at the farm they are set upon by Mr. Hansen and his hideously deformed chain saw wielding son. They are then thrown into cages to a wait their fate at the hands of these butchers. The back story here is that of the Hansen's but there is an adjoining story that the abductee's are being slaughtered and consumed by paying customers on the black market. This cannibal part of the movie is touched upon briefly but doesn't go into it as much as I'd hoped given the title of the movie. It is saturated in tributes and typical clichés throughout so is unoriginal but it is actually rather amusing, fast paced and entertaining. The setting and main story is based almost entirely on THE TEXAS CHAINSAW MASSACRE, the farmers surname is Hansen (in tribute to Gunnar Hansen) and the main protagonist, his son, is basically a skinny Leatherface! TCM is not the only influence here though, there are plenty of others that many will recognise I'm sure, up to and including a washed and dressed skeleton in the attic straight out of Psycho. The acting is bearable with the usual obnoxious characters you would expect, the family consists of a meek mother and her angry new boyfriend with her adult daughter, teenage nerdy son and younger brother. It squeezes in an attempted shocking twist with final girl Jess (Kate Davies-Speak) that you can see coming a mile off. The dialogue is again very cliched "you never stop to speak to the old man on the side of the road" type thing but I thought the soundtrack was great with a very synthy 80's slasher feel to it. There are some good gore close ups but at times I felt it needed a bit more to pad out some of the scenes. Fans of slashers, especially TCM will hopefully appreciate this..... maybe not much but it is a bit of a giggle.